Being stuck inside with the rain falling and thunder booming, especially after such overly warm spring weather, can cause even the most well-behaved child to go a little…..beserk. I know my two got so used to being outside for hours everyday, that now with the cooler weather, we struggle to find things to do to fill up the day. To keep at least a little bit of sanity in the household, I usually pull out my rainy day bag of tricks. Reading some extra books, painting, playdoh, and sometimes if it’s warm enough they’ll ride their bikes in the garage. I found this one via Pinterest and A Little Learning for Two on the last rainy day we had, and what a blessing it was. A few paper plates had been sitting in our cupboard (I bought them when I went to a conference – easy cleanup for Todd!) and I dug out my old paper towel holder. 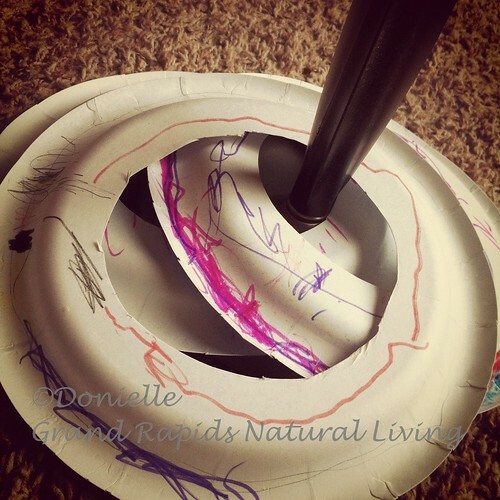 Putting it together is as simple as cutting circle in the middle of the paper plate and letting the kids color or paint the underside. And here I thought playing the game was going to be our morning activity. But instead, my kids spent almost an hour coloring their masterpieces. And not only does this activity fill up time during the day, it’s also a great way for kids to get their creative juices going, their imaginations expanding as they make up their own rules and games, and of course help to teach and re-teach patience as we wait our turn. One bit of advice though – tell your kids this is a throw away game. I just can’t get my five year old to toss them, and oh how I’ve tried. Most recently I tossed them in a box meant for the garbage and somehow he found them. And was less than thrilled with me.